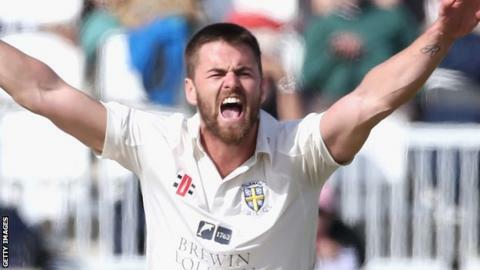 Seamer Jamie Harrison says Durham have not capitalised on their chances in the Championship so far this season. Durham are fourth in the Division One table but without a win in their last five County Championship games. "We've not been quite as switched on in recognising the moment and capitalising on it and that's what wins trophies," Harrison told BBC Newcastle. "We have got four games left in the Championship and if we win all of them, it will entitle us to second place." In their last four-day game against leaders Yorkshire, they had the Tykes 79-5 in their second innings, before a stand of 248 between Glenn Maxwell and Adil Rashid took them to 440 all out and eventual victory. The One-Day Cup however, has seen Durham's fortunes fare better with a quarter-final tie against Nottinghamshire at Trent Bridge coming up next Tuesday. "We are happy to get to the quarter-finals and we are in a good position at the minute to get to Lord's again," Harrison added. "We said if we could get to the knockout stages, we usually perform better as we come together as a team and get momentum rolling."